Braam Hanekom and Llewellyn MacMaster have just returned from Zimbabwe where they had discussions with lawyers, NGO’s such as Zimbabwe Lawyers for Human Rights (ZLFHR), the Counselling Services Unit (CSU), academics, former parliamentarians and prominent clergy, including pastor Evan Mawarire. 1. It is clear that Zimbabwe is facing a deteriorating economic and political situation. 2. All the signs are there that the country is de facto in the hands of a military government. 3. This goes hand in hand with human rights abuses. ZLFHR reports that they had to support over 900 political prisoners during the past month. 4. CSU reports that they treated 359 victims of abuse. This includes victims, who were beaten with sticks, iron rods, rifle bats or raped. 5. The Zimbabwe Human Rights Forum reported 15 illegal killings and 26 abductions (some of whom have been released). Evidence of women shot in the back is available. 6. It is clear that Zimbabwe is trapped in a culture of violence and intimidation that goes back as far as the Gukurahundi murders of the Ndebele in 1983. All indications are that current president Emmerson Mnangagwa and Vice-President Constantino Chiwenga as well as other current military and government leaders were involved and are still involved. Although the junior ranks in the police and military do not necessarily comply with this status quo, senior officers still have a huge hold on the country. This culture of violence and intimidation has become endemic to the actions of the army and police. 7. There are definitely indications of serious conflict within ZANU PF as well as definite ideological and other differences between the older generation and a new generation of Zimbabweans. 8. Indications are that (in the words of people we spoke to) “ZANU PF has lost the people”. 9. The deteriorating economic situation must be largely attributed to the small group of political and military elites, who are still focussed on enriching themselves on a massive scale. Even young officers in the so-called G40 group benefit from this and live in some of the most luxurious homes imaginable. 10. There is also an increasing internal battle over cash reserve management (including Zimbabwean bonds and US dollars) and commodities such as gold, diamonds, platinum, petroleum and oil imports and control. There is also great unhappiness among Zimbabweans over the weakening situation of the “bonds” that fuelled petrol prices and bread prices. Long petrol queues are already visible again. • Economic stability is essential and a rescue buoy of about five billion US dollars (used subject to strict conditions and international monitoring) can really help. • A new National Transitional Authority is advocated. Zanu PF is in trouble and will not be keen on it for various reasons, but the toxic relationship between elements in the army and ZANU PF is not sustainable. For decades now, Zimbabwe has not been a democracy. More and more lawyers are talking about crimes against humanity going back as far as 1983. The constitution adopted by 90% of the population in 2013 has not yet been implemented, but is urgently needed.  Amnesty and assurance that the ICC will not strike out at senior government officials is important. Otherwise a “fight to the end” scenario is definitely on the table. • International mediation and pressure is needed. Our feeling is that Britain realizes that the chance Mnangagwa has received has not worked. 12. The conflict within ZANU PF is intense with hundreds of soldiers guarding the homes of opposing leaders. Everyone is very uncertain about their safety and future. 13. The feeling among Zimbabweans can be described as a mixture of anger and fear. The conversation with Ewan Mawariri was gripping. His family is abroad for security reasons. He is not completely healthy at present and is clearly traumatized after his time in jail and (in his own words) his contact with prisoners, whose families were assaulted at home after their arrests. He tells of warnings not to eat food in jail except what has been brought by visitors. 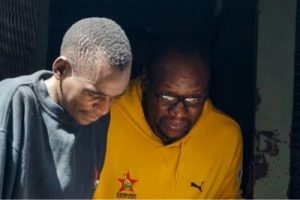 Poisoning of persons is currently a common rumour in Zimbabwe (including Constantino Chiwenga, who is currently apparently seriously ill in South Africa). 14. At this stage, we are pleading for intervention from institutions like the office of the Arch Bishop in Cape Town, the South African Council of Churches, the National Church Leaders Consultation, the South African and international governments. Pressure alone, however, won’t work, because you are dealing with a military situation that actually only knows one form of action. What is urgently required, is influence by people, who do not necessarily want to overthrow a government, but are level-headed and looking to create a win-win situation. 15. Traditional opposition politics will not function now. The news that Emmerson Mnangagwa is willing to speak to Nelson Chamisa from the MDC should be welcomed. 16. Zimbabwe’s future is going to impact South Africa’s future, but the impact can also be positive. 18. In conclusion, we were once again touched by the people of Zimbabwe. Wonderful, but bruised and traumatised. Zimbabwe is a mixture of hope and despair. May we be blessed with grace.